The rich mise-en-scene, charged with high-caliber performance, offered satisfying viewing for audiences last Friday and Saturday nights, of the historic reconstruction as part of the Los Angeles Philharmonic’s “Next on Grand” contemporary music series. The hanging, mesh thing-a-mabob—a gorgeous sculptural element, the bringing indoors a fragment of the external, come on, a chain link fence!—topped up Gehry’s two-tiered installed stage. The lower of the platforms, nearer to the audience, stood on tall legs that echoed the metallic theme. And through that portal entered a dozen dancers. Color-coded in white, red and black costume, they were akin to animals filing into the slaughterhouse so openly and plaintively did they give themselves to Childs’ rigorous and nonstop, really punishing, ballet minimalism. 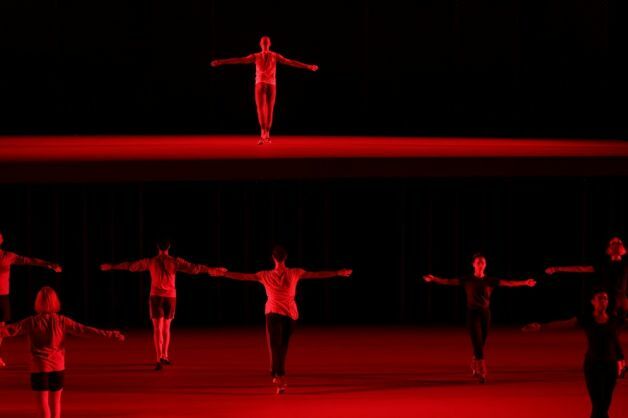 The full-hour showcase of dutiful, thorny, tongue-twisting, repetitive, balletic ‘enchainements,’ — strings of movement deployed this way and that, backward and forward, on high platform then on low — was all bathed in Beverly Emmons’ crazy-aggressive lighting scheme. Yes, beautiful and a fun blast from the past. 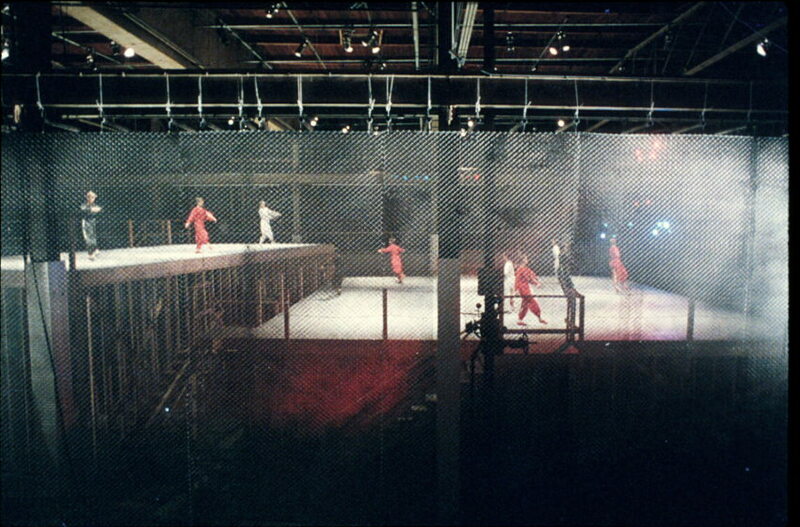 When I was around 25-years old and dancing in New York, this was the kind of work that I performed. Highly technical, patterned, heady dance minimalism. Disguised as easy-going, it was demanding, tough-minded, brainy. Little chaine turns, little chasse connectors, little pulsating rhythms, sparse, sparing, niggling even. An eensy lean into a forced-arch foot for respite. A directional swivel. A new start? At best meditative, at worse mindless, like hapless ping-pong balls, like little marching soldiers if only soldiers had pretty legs. olderHow “Girl Shy” was Harold Lloyd? Find out at the Villa Aurora. Thank you for your p.o.v., Janice. The choreography lacked imagination and intrigue. 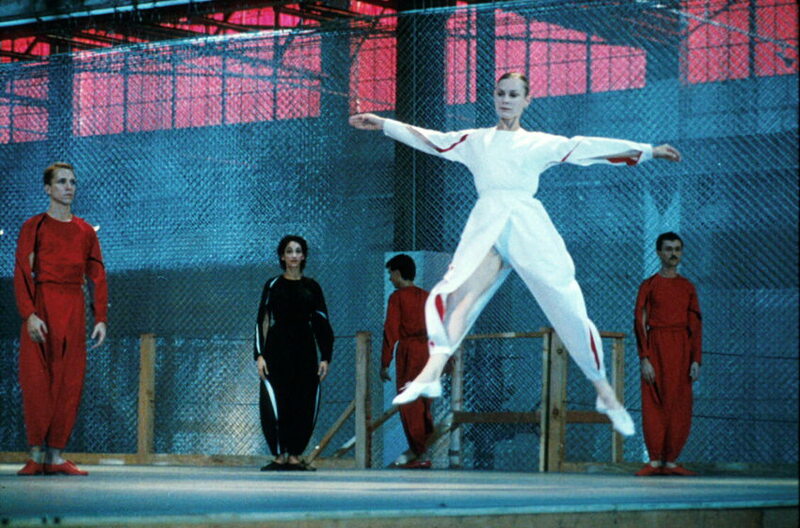 I found it over simplistic, as if a recital of mediocre dancers after a summer camp. There lacked passion and a want for more. The steps were not only repetitive,they were redundant and underwhelming. I would say, overall, time and money not well spent. It did not honor the grandeur that is the Disney hall. Mesh thingies our specialty! What a nice comment from one of L.A.’s most experienced dance observers. I love so much that you reviewed the mesh thing-a-mabob as much as the dance. I thought the performance was wonderful, the choreography was mesmerizing. It was so great being with you and hearing the history of it all. Makes a difference, let me tell you! Great to hear about your dancing background amidst the wave-like impressions. Honest and unfiltered.